In a breach of KT tradition we publish a FB post. However, with good reason. This is a reaction on the text written by Andrew Korybko for Katehon – generally a publication piling semi-idiotic political analysis together with some really quality stuff, which is a hallmark of the strategy of chaos so dear to it’s main luminary Alexander Dugin. The post was written by Matija Lukač, probably the most well informed – in the terms of on the ground knowledge – Croatian author about situation in Syria, who previously warned us about the fact that Korybko is either a charlatan or downright warmonger. This post is not concerned with Syria, but with Korybko’s article on Croatia (“Croatia Moves Forces to the Serbian Border“) from Katehon. We added some insults to Matija’s injury of this individual’s ignorant, but well packaged, warmongering piece. You will find KT comments typed in red. On the last note, this is not the only – and by far not the least stupid – attempt to warmonger on Katehon, but as Korybko is at least literate, which could not be said about some of other authors on that site, he deserves to be addressed. Some of the others are on the level of elementary school knowledge of geography and relations in international politics. I have to react to fabrications by certain „political analyst“. If there is something I hate so deeply it is this: a lie. And I will not turn the blind eye on someone who employs lies on huge scale regarding the region where I live. Yes, Croatia as a NATO member will participate in NATO missions in Eastern Europe and the Baltic States. And so will the country from which Andrew Korybko came from, the United States. To say that it was reported that the Croatian Army has deployed its troops to Vukovar, a small town located on the border with Serbia, is a blatant lie and serves only to his warmongering purpose. When the Saints go marching in: Liberation (sic!) 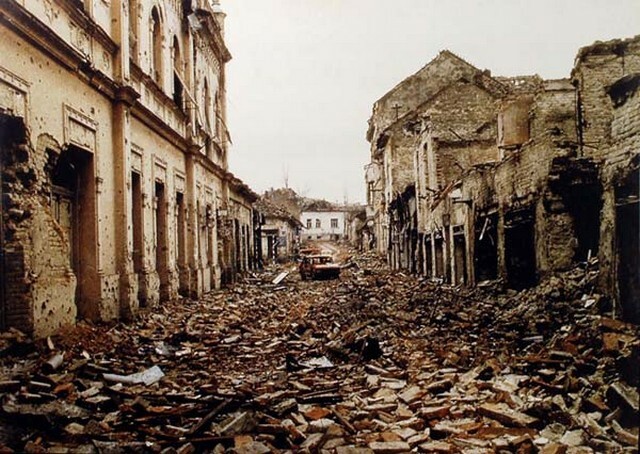 of Croatian city of Vukovar by Serbian army in 1991. If you have a Serbian acquaintance, ask him to translate the lyrics of their song. Fruits of Liberation by artillery fire re-decoration: Vukovar incorporated in Heavenly Serbia. Not a dime was ever paid for re-re-decoration, thanks to efforts of International community, supposedly “demonizing” Serbia. We already have our troops in that region for 25 years, but if we are to believe his words one could presuppose that Croatia is massing its troops to invade Serbia. The scenario which American warmonger would love to see. Croatian (ex) Prime Minister is in fact both Croatian and Canadian citizen, but the President has only Croatian citizenship. Croatia is not a state? Although I said plenty of times that Croatia is a puppet state of Korybko’s home country, to say it’s a colony is utter BS because American citizens cannot enter Croatia without visa. Another blatant lie is that US military strategists hold the Croatian army on alert for possible conflicts in the region. On alert? Since I know many active Croatian Army’s servicemen, and I myself was a soldier in the Croatian Army, the idea that there’s state of alert in army can only indicate that Korybko never met anyone who served in the army to explain to him the basics; as a segment of “serious” geopolitical analysis it’s just beyond comprehension. Nothing but the pure fabrication of an American warmonger, not unlike those currently warmongering with an eye on the Middle East, who knows nothing about how military system works. And for the part of possible conflicts in the region, this exists only in his brain – delusional or calculated, that remains to be seen – as well as in the heads of Far-Right movements who might want to see the new war, yet not really as eagerly as an American warmonger Korybko. We’ve seen enough of wars in this region, and we are sick of it – all of us. But that’s something that one warmonger can’t – and indeed should not – understand if he is to do his dirty job properly. Croatia received statehood in violation of all international rules and regulations? Maybe UN Resolution 1514 can answer how was Croatia in violation of all (Korybko really has written: ‘all’) rules and regulations. Another blatant lie and proof that American warmonger is not really such an expert, but manipulator and a liar. Crimea perhaps? Constitution of Yugoslavia didn’t allow any of six Republics to go rouge, but what was under the International Law and according to UN Charter is the same what Crimea called upon as the Republic which was in the federation with Ukraine. On popular referendum in 1991, 83,5% of electorate voted out of which 93,2% voted for independence of Croatia. Not to mention here that active Serbian co-opting of Federal Army and secretly arming Croatian Serbs was well underway at the latest from 1990., while media campaign for inciting Serbian nationalism was well underway from late Eighties. Slobodan Milosevic’s toppling of the governments of so called “Autonomous regions” Vojvodina and Kosovo, enacted by a primitive form of “color revolutions”, called in almost Heideggerian fashion “događanje naroda” (the coming to pass of the People), was poised to be a prelude to an overthrow of the Governments of Slovenia and Croatia, rendering the initial propositions of Yugoslav confederation obsolete. Not to mention that Federal Republic of Serbia amended it’s constitution on 28. September 1990. enacting a de facto independence in monetary policy, tax regime, administration and security – all this in order to appropriate funds from Federal Treasury and at the same time use them for it’s own purposes. A kind of clandestine independence for a clandestine war which was anything but civil war, as is the popular opinion in Serbia today. Not to mention that USA policy was firmly to stop international recognition of Croatia and preserve the “unity of Yugoslavia” which in effect meant “Greater Serbia” as State Department luminaries and secret services very well knew. Not to mention that in the first months of the war the bulk of “Croatian army” was constituted of men wearing sneakers and carrying hunting weapons to defend their homes, not seldom from their first neighbors who failed to inform them over the morning cup of coffee that they are being secretly armed and tasked with attacking them under the protection of Federal Army. Not to mention that Vukovar was razed to the ground during the siege which employed Yugoslav Air force and armored battalions – the army whose ground troops that were sent on their way down the Zagreb-Belgrade Highway of Brotherhood and Unity where greeted by the citizens of Belgrade, showering the armored columns with flowers. Not to mention that the whole higher political leadership of Serbia, except conveniently dead Slobodan Milošević, was legally whitewashed by ICTY and, by extension, International community in order to set it up for smoother integration in the Western structures, so not a dime of reparation will ever be paid for destruction it wrought upon Croatian and Bosnian cities. Not to mention that Serbian Radical Party leader from the Nineties, Vojislav Šešelj, was released of all charges by ICTY by defining his role in ethnic cleaning as “humanitarian” (you don’t kill everybody but put some of them on the buses and send them away, before you take their homes), while everybody knows that he is a psychopath at the time ran by still Yugoslav secret service to enact terror tactics in an effort to “ethnically cleanse” Croatia and Bosnia. Not to mention that Serbian Prime Minister and President of today both came out under the Šešelj’s wing, while Prime Minister was then a soccer hooligan, adherent of Crvena Zvezda soccer club whose militarized fans were ran by glamorous mafioso, former secret services assassin and psychopath Željko Ražnjatović Arkan with a task to build up the “strategy of tension” in Yugoslavia. Not to mention that Serbian Orthodox Church was and still is instrumental for harboring and inflaming the idea of Greater Serbia whose borders are delineated by Orthodox churches and, morbidly and more importantly, Serbian graveyards. Not to mention that this is just an appetizer. There’s a whole lot more where that came from. And at that time we didn’t really care about international community who in fact refused to recognize us. So, for Crimea is OK to vote in popular referendum to leave Ukraine, but for Croatia was not? For those who don’t know, Croatian Army has around 50,000 personnel, out of which active combat personnel numbers about 14,000. Maybe, just maybe we can get 10,000 soldiers to be ready to fight immediately, but no more than that. Huge military power of Croatia will soon invade Serbia. Or is it just an illusion of one warmongering liar? And what do you think if he’s making such lies about Croatia, how legit and truthful is he regarding any subject whatsoever, like Syria for instance? Do you find that your paranoid delusions about Alexander Dugin are getting worse and worse? Have you experienced nightmares you cannot wake up from? Are you losing grip on reality? You may suffer from the tragedy of GLENN BECK BRAIN DISEASE! Please help us fight this tragic condition and take our test to find out! I will not block this comment to make a point about rules for discussion on KT. If you want to insult me, please go ahead, but it has to be part of a rational argument. This idiot does no such thing. He puts few rhetorical questions, implying that I have paranoid delusions, losing the grip, etc. In the end I get compared to Glenn Beck. This, of course, serves to disguise the fact that what I wrote about Dugin is a philosophical critique which can be answered only by other philosophical critique (two articles on KT, look them up). On the other hand, the fact that editorial board of Katehon repeatedly endorses articles such as Korybko’s – which is by far not the worst I have read – makes this operation a work of charlatans at best, warmongers at worst. Now my would-be-interlocutor doesn’t address any of this – aside from not addressing any of the points of Matija’s argument constituting above post, therefore he leaves me with no alternative but to invite him to take a hike and bother his fellow juveniles. As I don’t indulge in debates which require educational sessions about what the debate is, please note that comments of this ilk will be blocked. Well, the commenter Akira probably had in mind the indisputable fact that Matija Lukač addressed and attacked Andrew upon the article “Croatia Moves Forces to the Serbian Border“. But what author failed to check is – that short article in Katehon was not written by Andrew Korybko at all. If author failed to check basic facts like who is the author of attacked text, than what credibility he could gain from the rest of this tirade which was triggered by that article? Therefore this article looks more like personal attack than real analysis. Since Matija Lukac failed to distinct facts from his imagination he discredited himself as trustworthy author. I guess he owes a public excuse for this blatant mistake. It isn’t even an “article”, it is a two paragraph news update. I see no evidence that it was written by Andrew at all. See how it’s easy to construct meaningful sentences, when you make an effort. It was an article and it was undersigned. Doesn’t matter, plenty of other stuff along that line on Katehon. I just tried to read your essays on Dugin… You need some work on that “meaningfull sentence” issue yourself. Just keep on trying and success is inevitable. Despite appearances, everybody can learn to read. Only imaginations about Croatia comes from Andrew Korybko and people who take that blatant liar and manipulator seriously. And who takes him seriously? Chetniks and ignorant Westerners who are swallowing the worst Serbian nationalist propaganda. Liars don’t deserve any apologies. Well I am saying the truth… as far as I saw it – Korybko never wrote just a 2- paragraph article, all of his rants are long and boring. Katehon publish such short infonews which receives from many “in the field reporters” and usually such short news do not have author’s name. So, Matija made a material mistake in his article. Everyone who reads this will know that he either didn’t check the facts or he lied intentionally. Matija, and people congratulating the author on social networks some time ago, saw it otherwise. You are trying to make a mountain out of a mole hill, and you don’t even have a mole hill! Why can’t you respond to something Andrew actually wrote? I already repeated myself more than one time about this. Read other comments before you put yours. The vituperative assignations of makers of sentences, the energy expended in the endeavor of identifying and calling by name the maker of this one or that one, logoi using, usurping, dissipating, suffocating logos, constructing its own deconstruction in its very, and often very-merry-making, making! The world’s too big. Alas, or I’m too small for it.